The red carpet was rolled out on June 23 at the Sonoma-Marin Fair for the 30th annual World’s Ugliest Dog contest in Petaluma, California. Many worthy competitors shuffled, snorted and slobbered their way down the red carpet to strut their stuff for the judges, vying for the coveted, prestigious title. The winner, sporting a beautiful pink collar and matching toes, was Zsa Zsa, a 9-year-old English Bulldog from Anoka, Minnesota. It wasn’t her fashion sense, however, that caught the judges’ attention. Zsa Zsa embodies the well-known English Bulldog physical traits including short legs, massive shoulders, chest and head, and wrinkled face, but her most endearing quality has to be her incredible, lolling tongue, hanging just inches from the ground thanks to an over-pronounced under bite and crooked teeth, both top and bottom. Zsa Zsa’s owner, Megan Brainard of Anoka, Minnesota, was over the moon with excitement when the judges crowned Zsa Zsa the winner of the contest. As if sneezing and flinging drool on the judges wasn’t enough to tip things in her favor, Megan feels it was Zsa Zsa’s awesome personality that won the judges over. “Everyone loved her the second they laid eyes on her!” says Brainard. “The audience couldn’t get enough of her.” Zsa Zsa and Brainard received $1,500 and an impressive trophy. NBC flew Brainard, her fiancé, her father, her baby and Zsa Zsa to New York City for a three-day visit and an appearance on the Today Show. While lovingly mocking beauty-challenged dogs may be one part of the contest, it is actually a celebration of the contestants, many of which were rescued from puppy mills and shelters and promotes the idea of adopting dogs in need of homes. Zsa Zsa herself was a puppy mill survivor. “She was a breeding dog in a puppy mill in Missouri,” says Brainard. Identified by a number instead of a name, she ended up at an auction when the mill was done with her where Underdog Rescue in Minnesota purchased her. Brainard owns two grooming shops, and when she saw Zsa Zsa on Petfinder four years ago she messaged the rescue group offering to groom her for free. “She was exactly how I thought she would be…. Sweet and such a ham!” shares Brainard. After all she’d been through, Brainard was amazed at how “go-with-the-flow” and happy she always seemed to be. “We groom many puppy mill dogs who act quite the opposite,” says Brainard. Needless to say, Brainard’s home became Zsa Zsa’s home. When asked about the inspiration for her name, Brainard described how Zsa Zsa used to lounge on her bed, looking like she was modeling. “I googled famous models and saw Zsa Zsa Gabor,” says Brainard. “I just knew that was going to be her name!” Lounging was actually Zsa Zsa’s favorite thing to do, be it on her pink leather bed or the couch. Toys weren’t her thing, but she loved going for car rides, watching “The Price is Right” with Brainard’s father, and having a snack at Chipotle. All of Zsa Zsa’s favorite things are now past tense as, sadly, Zsa Zsa passed away in her sleep a few weeks after she won the contest. While she did have some typical signs of poor breeding, most of which helped her win the World’s Ugliest Dog contest, she had no life-threatening health problems that Brainard was aware of. Brainard’s heart is broken and she is still trying to process Zsa Zsa’s win, her fame and her passing. They had so many plans to help rescue groups, be advocates to expose puppy mills and get the word out to adopt rather than shop. But most of all, that Ugly Is Beautiful! We can all do our part to expose and shut down puppy mills and their irresponsible breeding practices. While Zsa Zsa has gone over the Rainbow Bridge, her beautiful face can still be the inspiring face of change. In 1845, the construction of a road from Milwaukee to Fond du Lac was authorized. The half-way point was a rest stop for travelers and what is now the city of West Bend. Incorporated in 1885, West Bend was attractive to settlers, in part, because of the Milwaukee River that ran through it that was used to produce energy for power. West Bend is now a thriving community bustling with events and attractions for its residents and visitors alike. Every season features new activities and attractions. But wait, this is supposed to be a column highlighting interesting stories about dogs, isn’t it? This brings us to Maggie, one of West Bend’s four-legged residents and the Customer Sales Representative for Schalla Jewelers, one of the many Historic Downtown specialty shops. 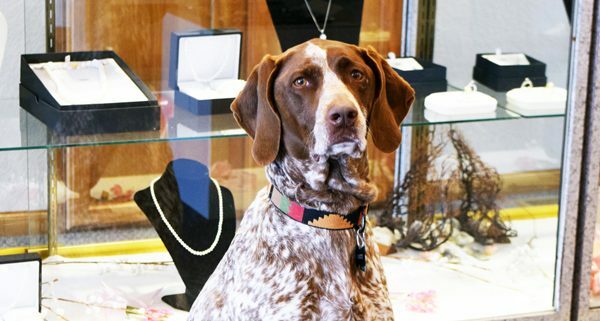 Maggie is a 7-year-old German Shorthaired Pointer, who belongs to Douglas Schalla, the owner of the jewelry store. He’s been bringing Maggie to the store since he got her at seven weeks of age, and his customers are drawn in not just by the pretty jewelry but by Maggie’s inviting face in the front window. In fact, she gets more visitors than Douglas does but he’s okay with that. “It puts many people at ease when they see a dog here,” says Schalla. Maggie even gets quite a lion’s share of Christmas presents from customers and visitors. She’s perfect for her role as Customer Sales Representative. “She’s good-natured, smart, loves everyone and loves hanging out at the store,” adds Schalla. Official greeter is one of her very important responsibilities and she takes this role seriously, politely greeting customers as they come through the door, expecting only a kind word or two and a pet in return. One of her favorite visitors is the FedEx delivery man who predictably supplies her with tasty morsels. Nothing gets past Maggie’s nose, and she’s been known to sniff out treats in customers’ pockets, some of which they share with her if Dad deems them safe. When not performing her “Greeter” duties, she loves to exercise by running around the jewelry cases or by sitting in the front windows watching passersby. When the afternoon sun starts to stream through the front windows, Maggie channels her inner cat and lounges in the sunbeams. Prior to learning about Schalla Jeweler’s canine greeting committee, I hadn’t had the opportunity to spend time in West Best and was very surprised to learn of all that the West Bend area has to offer. As my daughter and I visited with Maggie, Douglas shared with us some of the highlights of the area including the massive Farmer’s Market that is held on Saturdays from May to October in the heart of downtown West Bend and the 25-mile Eisenbahn State Trail where Maggie and Douglas love to hike and enjoy nature. Other area attractions include the Kettle Moraine Northern Unit, the Ice Age National Scenic Trail and Ridge Run Park, an area made up of steep ridges and valleys sculpted by glaciers, and featuring hiking, fishing, ice skating, a lighted sledding hill and ski trails. Outdoor attractions aren’t all the area has to offer. West Bend boasts a nice assortment of museums and a thriving arts community with entertainment ranging from a symphony orchestra to Broadway musicals, not to mention the wide variety of shops and eateries. When not working, Maggie loves to run on the 68 acres at home while Douglas drives his ATV around the property. There are great smells everywhere that are thoroughly appreciated by Maggie, true to her German Shorthaired Pointer heritage, and she enthusiastically enjoys tracking critters and stalking rabbits. She is trained to hunt game birds and, when they have time, Maggie and Douglas do some hunting. If you find yourself in West Bend to enjoy all that it has to offer, be sure to stop by Schalla Jewelers at 235 S. Main Street to say hello to Maggie and Douglas and peruse the wide assortment of jewelry. It’ll be the shop with Maggie’s pretty face in the window. Word is out around Milwaukee. There’s a cute new gal with blonde, curly hair working at the Hilton Milwaukee City Center. It’s Millie, the canine concierge. 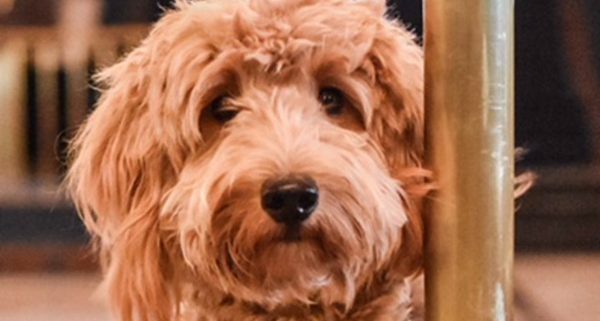 At just one year of age, Millie, a mini Goldendoodle, is very popular and regularly receives emails and comments via the hotel website, great Trip Advisor reviews, and dog treats, sweaters and toys from adoring fans (aka hotel guests). Her proud owner, Rusty Dahler, the human concierge at the hotel, was thrilled to share Millie’s story with FETCH readers. “Last fall the idea for a ‘hotel dog’ began to circulate,” says Dahler. “A great idea never happens easily,” he adds. “It takes a lot of determination and hard work.” He set to work finding just the right dog for the job, researching breeds and talking to breeders and decided on a smaller, non-shedding dog with a phenomenal temperament. Millie, whose name represents Milwaukee (first and third syllables), fit the bill perfectly. Born September 13, 2016, Millie went home with Dahler at eight weeks of age and by ten weeks was spending a few hours at a time at the hotel. She now spends 40 hours a week in the lobby and hotel, brightening the day for guests and employees alike. As one would guess, training has been and continues to be a focal point for Millie. Dahler explains that it’s been a lot of work to train a puppy in such a large hotel and to teach her all the things she’ll need to learn including not jumping on guests and coming when called. Holly Lewis, a Certified Professional Dog Trainer and owner of Cold Nose Canine, has worked one-on-one with Millie as well as in group classes. “Millie’s private lessons are focused on specific skills that Millie utilizes at the hotel,” says Lewis. “Millie learned to stay out of specific areas of the hotel as well as showing guests where the restroom is from the concierge desk.” The “say hello” cue directs Millie to the check-in line where she greets guests. She may even bring along her favorite ball for someone to throw. Other important tasks include riding luggage carts up to the rooms for deliveries and standing proudly on the podium at the front door, smiling and wagging her tail as guests arrive. “On the flip side,” adds Lewis, “it is really important for her to remain in tune with Rusty so she does not wander off and get distracted with a guest. Recall and focus are important points of Millie’s training.” The need to be able to easily adapt to the fast pace and changing environment of the hotel lobby is the biggest goal, according to Lewis. “There are always people and animals breezing through the lobby and it takes a special dog to be able to handle the activity,” says Lewis. “Millie has changed the environment in our lobby by 100 percent,” shares Dahler. He knew she’d have an impact on the guests, but he never guessed the impact she’d have on the employees. They stop by the desk to share phone pics of their dogs and love on Millie as if she were their own. Fellow co-worker, bellman Jack Wood says, “Being able to experience Millie’s friendly and playful personality is the reason both myself and the guests keep coming back to see her every day.” Millie takes all the attention from guests and employees in stride, and that’s part of what makes her so special. “She gives a lot to her work,” says Dahler. She’s petted hundreds of times per day, often awakening from a nap because an eager guest really wants to say hello. Like any hard working employee, Millie deserves and enjoys her time off. “Home is her restful space where she can do what she wants to do when she wants to do it,” says Dahler. “She enjoys walks on Brady Street, playing with dog friends at Pulaski Park and dog training classes at Cold Nose Canine,” he adds. She also enjoys the company of Oliver and Rose, Dahler’s two cats. “Oliver and Millie love to hang out and tussle together while Rose enters in only when she thinks it appropriate.” As for toy preferences, the more squeakers the better, but long toys she can play tug with are also preferred. Dahler explains how rewarding it’s been to see her progress and to hear guests comment on how well-behaved she is. “She has brought smiles, laughter, and even tears to many within her short time here and we can’t wait for more of this to come as she grows older with the Hilton Milwaukee,” shares Dahler. For more info check out “Millie At The Hilton” on YouTube; on Instagram at “hiltonmilwaukee” and on Facebook at Hilton Milwaukee City Center.